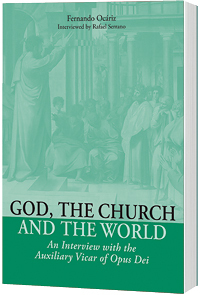 In this interview by Rafael Serrano, Msgr. Ocáriz offers insight into the deeper reasons for the current climate of crisis felt in certain fields. He gives a broad perspective that embraces both historical experience as well as that which transcends it all: God's action and human nature. This endows his vision of things with a kind of peace that does not shield him from reality, rather it is an attitude that offers great insight into his character. He speaks calmly and with warmth, and often smiles.